The scariest shark on celuloid got a full restoration for its high-definition debut. The Blu-ray release of Jaws is part of Universal Studios’ 100th Anniversary celebration. Steven Spielberg’s 1975 Oscar-winning film is one of those classics we’ve been begging to be issued on Blu-ray. Who doesn’t want to see those pearly white shark teeth in high-def? And we’re thrilled to see that Universal isn’t going the Jurassic Park route, releasing all three films in the series in one set so that you have to buy the set even if you just want that first — and best — movie. The PG action film stars Roy Scheider (The French Connection), Robert Shaw (The Sting) and Richard Dreyfuss (Red) as a ragtag team of a police chief, fisherman and marine scientist, respectively, who take on the task of catching and killing a gigantic white shark that’s eating the swimming residents of beach community Amity. Nominated for Best Picture, Jaws won Oscars for film editing, sound and its well known score by who other than Spielberg’s usual composer, John Williams (War Horse). When it was released, Jaws broke box-office records and over the years has earned an estimated $430.5 million worldwide. 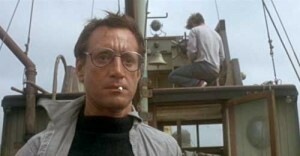 Based on the novel by Peter Benchley , Jaws is still one of the highest-grossing films in motion pictture history. It spawned a sequel in 1978, Jaws 3D in 1983 and Jaws: The Revenge in 1987. But none match the initial shark attack, which was the only one directed by Spielberg. As well as a digitally remastered and fully restored film, the Blu-ray/DVD combo offers Williams’ brilliant score and the Oscar-winning sound in 7.1 DTS-HD. First, the documentary The Shark Is Still Working, named after the fake shark that was notorious for breaking down. The feature-length documentary contains newly released footage and interviews with the cast and crew, including Spielberg, Dreyfuss and Scheider. Second, Jaws: The Restoration, an in-depth look at the film’s restoration. The DVD disc in the set offers “Spotlight on Location: The Making of Jaws,” with highlights from the full-length documentary.